Fewer crimes in Petersburg could be prosecuted in the near future. At least that’s what the Petersburg Borough fears might happen with budget cuts to the regional D.A.’s office. Everyone knows the story by now. Very low oil prices caused state budgets cuts in all branches of government. What that means for prosecuting crime in Southeast was conveyed in a recent e-mail from Juneau’s District Attorney, James Scott, to local police departments. He said the state attorneys will still look at each crime on a case by case basis but minor mistakes in reports will likely put the case to the bottom of the pile. 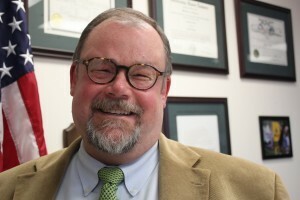 “So what I find myself and what other lawyers find ourselves doing is taking that file that has the minor mistake in it that in the past we would have rectified in an afternoon and putting that file aside and turning our attention to another file that doesn’t have that mistake and that needs to be processed in a timely manner,” Scott said. Scott said he’s not being critical of local law enforcement offices—he knows everyone is busy—but he wants officers to know how they can help prevent hang ups. Petersburg Borough Manager, Steve Giesbrecht, conveyed the message to the borough assembly at their last meeting. “They don’t have the staff and will make decisions based on—even if it’s a good case—if it takes a lot of work and is not significantly important, they will dismiss it,” Giesbrecht said. The Department of Law cuts include three full-time positions in Southeast: an assistant D.A. in Juneau, a law office assistant in Juneau and an assistant in Sitka. That leaves just three lawyers in Juneau to prosecute cases in Southeast. Petersburg Assemblyman, John Havrilek, pressed the borough manager for what it might mean locally. Giesbrecht said that Petersburg has a great relationship with Scott but with his office being so short-staffed he’s going to find it difficult to maintain his presence here. “He’s very clearly said, ‘Look, I’m not going to make as many trips to Petersburg. In fact, there may be long periods of time where I’m not available to come’,” Geisbrecht said. Kelly Swihart, Petersburg’s Police Chief, said the reality is that Scott lost a third of his attorney staff and 50 percent of his support staff. Swihart said, so far, no Petersburg cases have been declined but he would like to follow Scott’s suggestions and do more preparation locally before submitting cases to Juneau. He said they recently consulted with a retired prosecutor on a complicated case to make sure they were on track. “So if we can get all those boxes checked before we send a case to the D.A.’s office hopefully there will be less questions later and that dismissal rate won’t go up,” said Swihart. And essentially it’s up to the local PD as to what gets sent to Juneau. Not everything constitutes a crime. “There are cases where we can write a simple ticket, they go pay their fine at the office and they’re done with it rather than go through that criminal process,” Swihart said. In the Juneau D.A.’s office, Scott is trying to continue to do his work as usual even though his caseload went up one-third overnight. Department of Law budget cuts haven’t just hit Southeast Alaska. The D.A. office in Barrow was closed down and cases from that region are now being prosecuted in Fairbanks. Another safety measure that Petersburg is looking into in light of budget cuts is a Neighborhood Watch-Crime Stoppers program. That would allow local residents to voluntarily watch for crime in their neighborhoods. Assemblyman John Havrilek is spearheading the effort. He would like to get training for residents who are interested in participating.